What an exciting week in Charleston, SC it was! 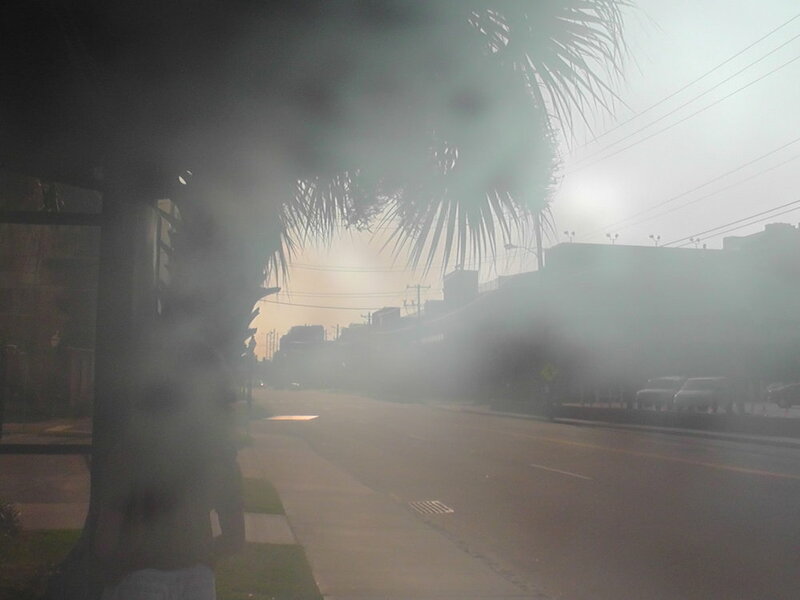 The expected tropical storm Debbie had passed by unnoticed, leaving us with seven sunny, hot and very humid days. Taking pictures outside was a challenge, as camera lenses would get foggy in a matter of seconds. The College of Charleston is located on both side of St. Phillip Street, one side modern, one historical. Our busy schedule spanned from 9am workshops and lectures to late-night concerts daily – it wasn’t always easy to wake up the next day! Technique workshops led by Dale Kavanagh, Marco Tamayo, Odair Assad and others, gathered about 20 to 30 guitarists of all levels, hungry for new exercises and practice methods. Dale introduced basic right and left hand exercises for building strength and coordination development: hammer-on slurs, arpeggios, stretches. Marco Tamayo discussed the 8 natural hand movements used in guitar playing and stressed that everyone can play without tension as long as they are aware of the naturalness of these movements. 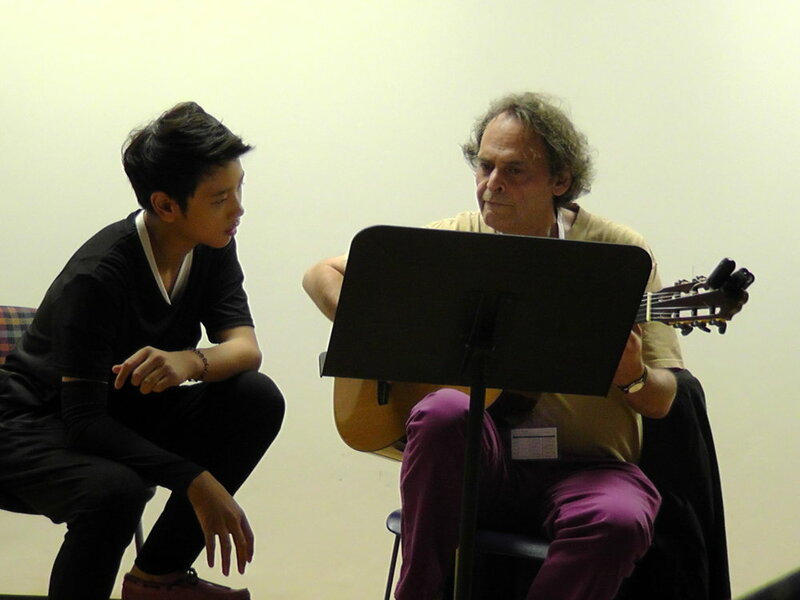 We were lucky to have attended Roland Dyens’ and Sergio Assad’s masterclasses. Both maestros put an accent on musical playing: melody leading, sound quality, art of expanding and contracting time as the phrase unwinds etc. Pieces performed in masterclass were from intermediate to highly advanced levels. One of the YIC participants performed Dyens’ Hommage a Villa-Lobos, a piece requiring impeccable technique and boldness to perform tricks such as retuning a string during playing with the risk of it remaining out of tune for the rest of the piece. “What kind of crazy person wrote such a thing? !” – Dyens turned to the audience with a disturbed face. – “I don’t know, I don’t know…” After the next student had played a Bach gigue, we spent some time voting which note sounds better, F or F-sharp, in the ambiguous spot where both are possible. If you ever have the opportunity to play in his masterclass, do! I only caught the final student at the Sergio Assad masterclass, who was playing the Jose sonata, 2nd movement. Assad talked about the form, switching moods and being aware of these changes at all times, i.e. always with the “big picture” in mind. 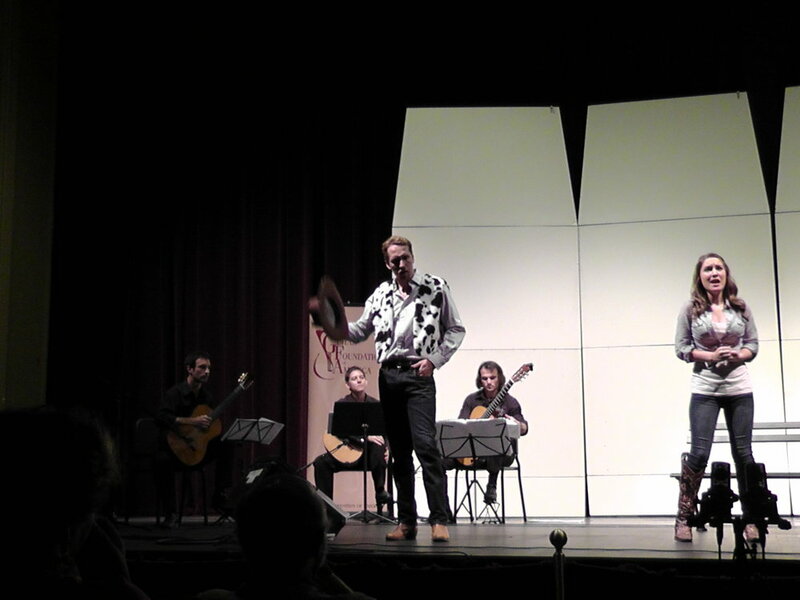 A morning coffee substitute on June 28th, there was a refreshing video lecture by Brian Jeffery on Sor’s Spanish songs, followed by vibrant live soprano and tenor performances. On the same day, Victoria’s own Alexander Dunn gave a lecture on “Beethoven Songs with Guitar” which consisted of an excellent visual presentation and live performances of the songs with a local tenor. Enjoyed very much was the thick, dark sound of the guitar blended with tender vocal lines. Top quality – no surprise there! Yoga for guitarists – a great torture device for those not enough tortured. 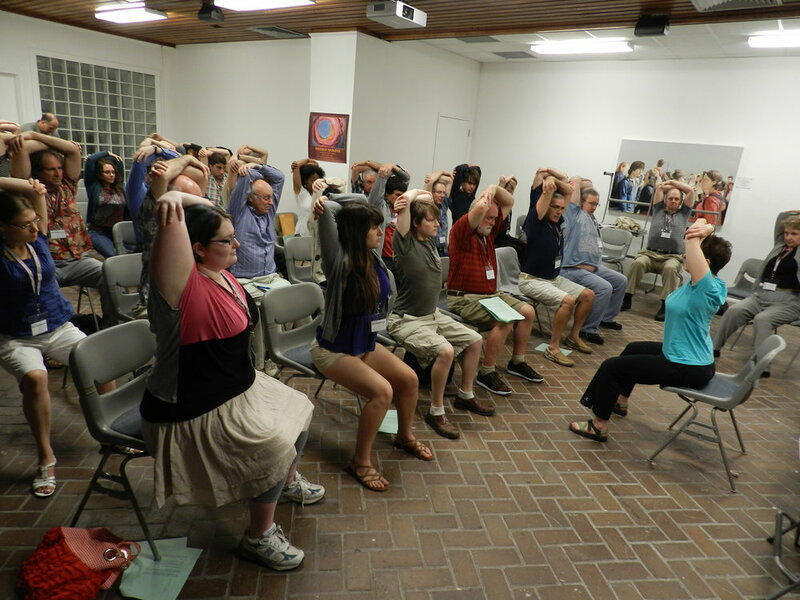 Helene Rottenberg demonstrated various stretches for fingers, wrists, necks, backs and shoulders. Every now and then a pitiful moan would fill the room – the sound of someone unable to get out of the “downward facing cow”. Jokes aside, stretching works. There was no lack of listening material – solo and duo concerts were presented daily at 4pm and later at 8pm. Among attended and greatly enjoyed were performances by Dale Kavanagh, Bandini/Chiachiaretta duo, Roland Dyens, Assad brothers, and Marco Tamayo. For those with a starving intellect, who have seen and heard it all, plenty of new music was available from off the concert stage. Additional details on those concerts is available on the GFA website. The omnipresent Roland Dyens would appear unexpectedly behind our backs joking and giving out generous hugs to all creatures big and small. At the concert, a true snake charmer, he would put the audience into complete silence with his utterly delicate yet colourful sound, full of loving emotion and warmth towards all and everything, projecting something all of us dream about – the ultimate, multi-dimensional freedom on the guitar. The vendor expo presented a bouquet of music publishers (including Matanya Ophee and Mel Bay), guitar accessories vendors (such as StringsByMail and Oasis), multiple CD recordings, and luthiers (Kenny Hill, Jean Rompre, Steven Walter, Wood Ring Guitars, and others). We got to take home free strings! Pieces for guitar orchestra this year were, apparently, less difficult and much more enjoyable, as per the orchestra participants. Some light I. Albeniz and C. Machado - not entirely together but definitely with feeling! A lovely musical surprise was Mozart's comic mini-opera Bastien and Bastienna arranged for three guitars (+voice) by Timothy Walker. Very well staged, lots of expression and well-projected mood. Both the youth and adult competitions confirmed once again that the level of playing is only climbing up each year. Most of the kids-finalists are previous winners of multiple competitions as well as experienced performers, including performing with symphony orchestras. The Junior division (under 14) 1st prize was taken by Kevin Loh (Singapore), and the Senior division 1st prize by Huaicong Mu (China). Both played with great technical mastery and musical sensitivity, even surpassing some of the adult competitors! Our local guitarist and VCGS member, Liel Amdour, took part in the Youth competition along with 38 young guitarists from all over the world, and had the great opportunity to absorb wisdom from such guitar masters as Marco Tamayo, Sergio Assad, Gaëlle Solal, and Giampaolo Bandini. Cheers for Liel! Clash of the titans in the final round involved everyone performing a mandatory piece, Andrew York’s How Funky Are You this time, and a free choice program. You really had to soundpaint in York’s piece which was extremely easy to play flat and gray. First prize was taken home by the Russian performer Rovshan Mamedkuliev. 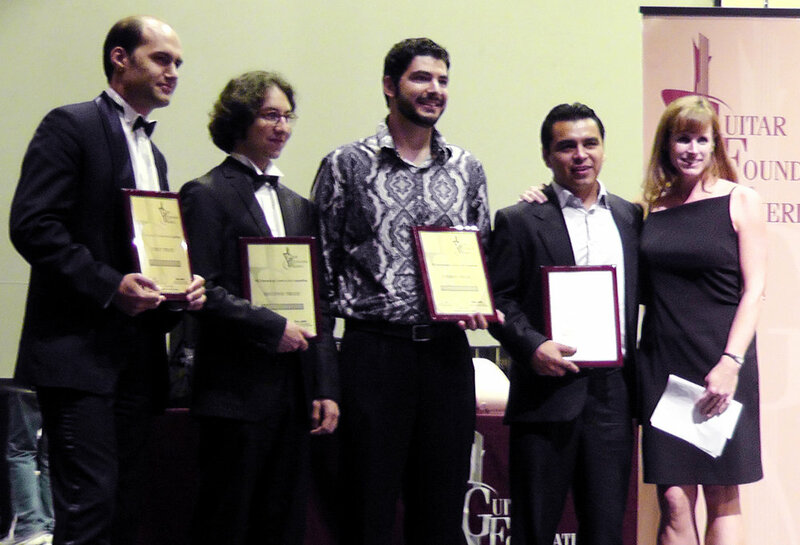 Celil Kaya (Turkey) came in 2nd, Silviu Ciulei (Romania/USA) 3rd, and Ivan Sanchez Flores (Mexico) 4th. Here they are! We happened to meet a local Charleston guitarist and composer, Ulyana Machneva, who was also taking part in the Adult competition. Originally from the Ukraine, Ulyana has performed and composed since an early age. Blessed by one of the most prominent Soviet (and now Russian) composers Nikita Koshkin, Ulyana has since created an abundant repertoire of guitar works, for solo and ensemble performance, for all ages and levels. She is currently teaching at the Charleston Academy of Music as well as continuing her guitar studies with Marc Regnier at the College of Charleston. Apart from the soul and intellectual food consumed non-stop, we enjoyed the Caviar&Bananas café on George St. as well as Asian cuisine on King St. Ashamed to admit, it didn’t get to trying ice-cream. The convention felt much like a long-awaited family gathering which, according to Martha Masters, signifies ‘mission accomplished’ for this year. Watching the masters and competitors on stage, I was convinced once again of two things. 1. For some, playing guitar is like performing a surgery: one wrong move, and the patient is dead. You pronounce him dead and yet continue on with the surgery. 2. For others, playing guitar is like telling a story or painting a picture that’s been forming in the mind for years – in which case, stopping for breath or putting an accidental stroke in won’t hinder the forward motion of the plot or minimize richness of the colours. It has probably been written and said before. Some more pictures of the beautiful Charleston. Hello, lovers of music! It is time to get inspired to practice those scales, arpeggios and tremolos. This piece has been called one of the most musically satisfying classical guitar works ever written. Inspiration guaranteed, or your money back! The very same Giulio Regondi wrote beautiful pieces for the concertina. Here is one performed on an accordion. Hopelessly sensitive and romantic, Regondi was.